In 2010 I purchased a shiny new AstroTrac. It turned out to be probably the most enabling and life changing piece of astronomical equipment I ever purchased. The power of a simple tracking mount such as the AstroTrac is realised with the combination of modern DSLR cameras supporting live view and good sensitivity. 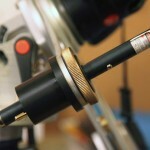 A custom made fitting holds a 5mw green laser point to the polar alignment fitting of the AstroTrac. Astrotrac Mounted on top of Losmandy GM-8 Tripod. A nice combination of medium portability with excellent tracking accuracy of the Astrotrac. 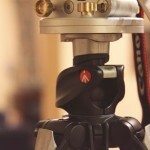 Astrotrac Mounted on top of Losmandy GM-8 Tripod (attachment piece). Re-using attachment knobs belonging to the Losmandy. Astrotrac Mounted on top of Losmandy GM-8 Tripod. Super rigid for longer focal length and longer exposure work. What’s so good about the AstroTrac? That’s only two points, but that’s all it needs. You can hike a couple of kilometers up a hill to a scenic location with the AstroTrac then record long exposure (5 minute) photographs within 10 minutes of arriving at the hilltop. The possibilities are endless. The AstroTrac has re-inspired my more artistic side of astronomy, enjoying capturing wide field photographs incorporating landscape and man-made elements which help relate the wonderful night sky to the surroundings we know and are more familiar within. Polar alignment of the AstroTrac can be troublesome in the southern hemisphere if you rely on the avaialble polar scope sold by AstroTrac. I would recommend configuring a laser attachment as I have (see pictures above) for easy polar alignment. Setting up the AstroTrac is very quick, usually within 10 minutes I will have it polar aligned to a precision high enough for 5 minute exposures at 40mm. I don’t attempt longer than 5 minutes (for various reasons, one I am impatient and want to see the results!). 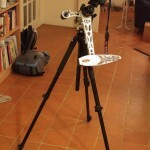 Place Manfrotto 190XPROB at the desired spot and level it roughly. Attach the AstroTrac to the tripod by rotating it on (note, I have my AstroTrac TT320X-AG permanently attached to the wedge TW3100, so at this point I am attaching that whole assembly to the tripod – you might not have the TW3100 and so may need to first attach a Manfrotto Geared Head or such, then the TT320X-AG). Attach the ball join to the AstroTrac by rotating it on. 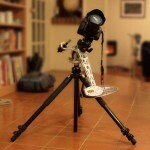 Attach the camera to the tripod via quick release plate. Attach the interval timer to the camera. 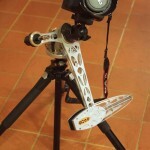 Level the tripod by observing the bubble level on the AstroTrac wedge TW3100. Using a compass, standing 1-2m back from the AstroTrac rotate the head until it is aligned to the south (north if your’e in the northern hemisphere). You can rotate the head by losing the 190XPROB rotational adjustment (centre shaft rotates) then clamp that and fine tune using the azmith adjustments on the AstroTrac TW3100 wedge. The following steps must be done when dark. 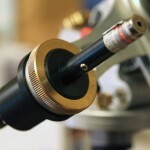 Place the laser pointer in the polar alignment holder and clamp it on using an improvised clamp. Using a clamp to keep the laser turned on leaves you with one hand for making adjustments and one hand for holding the binoculars (see below). Using binoculars look at the south celestial pole and the green laser. Using adjustments on the TW3100 wedge (and tripod if necessary) fine tune the polar alignment such that the laser is pointing at the south celestial pole. This process becomes very quick once you become familiar with where the south celstial pole is (I suggest aiming for the exact pole, not sigma Octans, you will get to know where it is). You may wish to have a star chart in hand, I have a pre-prepared annotated image of a star map showing the polar area on my iPad, marked with rotations for the time of year, so its’ easy to find. Lock the wedge and tripod adjustments down and check the alignment to see if it moved at all when locking down. Make corrections if necessary and re-tighten. If I want high precision alignment I will first put my William Optics Megrez 80 telescope on the AstroTrac (attached via a quick release plate also) and observe the location of the green laser pointer with respect to the south celestial pole at higher magnification through the Megrez 80. Once correct I will then carefully switch the Megrez 80 for the Canon camera, being careful not to knock or otherwise move the tripod and AstroTrac. Doing this does result in a more reliable alignment but is not necessary for shorter exposures such as 2 minutes. Another way to make use of this setup fun is to have a cable hanging off your camera with camera adaptor attached ready to connect directly to an iPad. I enjoy connecting the cable to the iPad now and then between exposures to have them on the iPad for fiddling with while the camera continues to take more photographs. It’s good fun and gives instant results that look great out in the field. Having the cable always on the camera I don’t bump/knock the mount/tripod in doing this, I just leave it dangling there when not connected to the iPad. See my Milky Way gallery for some examples of astrophotography you can take using the AstroTrac. The big attraction of the Vixen Polarie is it’s extreme compactness. It is so much more compact than even the AstroTrac. Even I would like one for this reason. The biggest downside I see is that it relies on worm gears similar to most telescope mounts which inherently have more error in them, so the periodic error in the Polarie is never going to match the AstroTrac. This would make perfectly tracked photo’s harder (to some degree, I don’t know to what degree). For similar reasons it is also limited to 7lb capacity (which maybe ample!) where as the AstroTrac can be loaded up with 33lb(15kg)!. Keep in mind that with astrophotography you don’t want to be pushing a mount to it’s limits. The astrotrac has additional accessories to help make larger loads more convenient too. The attraction of the Losmandy would probably be in it’s ability to track for more continuous hours than the AstroTrac (which is limited to about 2 hours). For time lapse this is important, but for astrophotography (still) this is irrelevant as the AstroTrac is easy to rewind and you can accurately reposition the camera after re-wind quite easily if you have a good quality ball joint head in use. Personally I am turned off the Losmandy Starlapse because it is based on a Losmandy GM-8, which I have found to have poor Periodic Error, require regular user tinkering and maintenance, and is quite bulky and cumbersome.